The newest high-tech prosthesis is of little use if it is not well connected to your body. Over and over again the socket proved to be the weakest link that can be the make it or break it point determining the activity level of an amputee. And as our bodies change over time, so do our demands towards this connections between our residual limb and our prosthetic device. Working with a liner system combined with a movable seal-ring is one of the options we have to create a well-fitting socket with a strong vacuum suction. With the mind-boggling developments in the prosthetic sector in recent years, people’s attention is often focused on the newest microprocessor knee, arm or hand, the cool carbon running blade or the stunning silicone cover that is hard to tell apart from real skin. And in many cases this attention is well deserved, as all of these development have brought about an immense increase in the quality of life of the majority of amputees and people with other limb differences. impacting on your blood circulation. But having a well-fitting socket is easier said than done. Even if your residual limb is well modulated and has enough muscle tissue for a prosthetist to work with. Things get more complicated for people who are affected by changes in the volume of their residual limb. Then building a well-fitting socket can be an enormous task close to the impossible. Even for a very experienced prosthetist with the patience to put in the extra time and out-of-the-box thinking that is often needed. I lost my leg in late 2005. And after the initial weeks of healing and recovery, I quickly got a socket that worked well for me. I wore the prosthesis all day long, mastered my day to day life by myself and mostly by walking and public transport and after a bit more than three months I was back on my job, full time, with long travels to Asian and African countries. I was active, I was fine, I was happy and content. But for the last 5 years I have had more and more problems with my residual limb. The volume changes throughout the day, throughout the week, throughout the month. A socket I find almost impossible to get into in the morning almost falls off in the afternoon. A socket that gives me great foot placement even off the beaten track and allows precise footwork on mountain paths on one day, hardly gets me around the house the next day. As I love to be active and independent, the issue of finding a well-fitting socket has been on my mind for a long time. I changed from a pure vacuum system to a liner system,. We added an additional rubber seal to the liner. And while some of that worked for some time, I still wasn’t fully satisfied. While over the years my prosthetist and I kept on working on various options, I have come up with my own DIY solutions. Some only as back-up options if things get pear-shaped when I can’t afford it, some other I used several times a week. From stuffing cut-off pieces from my liner into my liner when additional volume was needed to playing around with little heavy duty air cushions that are normally used to level radiators and other heavy things around the house. From using tons of good old Duct tape to building additional seals from expanding foam and security glazing tape held in place by kinesis tape. Some of it worked well, some of it was completely useless. All of it kept me looking for other options. And just last week I think I found something. The new seal-ring from Össur. It’s called Iceross Seal-In X-Grip and it comes in several versions. I have only been using this new seal for a week - this this is just a first impression - but so far it is working tremendously well. Despite the fluctuation in my residual limb, the seal keep the vacuum nice and strong. The design allows to fold the main lip over two easily add a thin socket or something else to quickly adjust to my needs. And - great for people who like to travel light - the seal-rung is treated with some kind of coating. Don’t ask me what it is but it means there is no need for any lubricating donning spray. And it is said to keep it’s form and size for a long time, preventing it from overstitching easily (a problem I had with the predecessor). As I said I only used the new seal-ring for a week so far. But I will test it extensively throughout the summer and will let you know how it went later on in the year. If you also have problems with an ill-fitting socket due to volume changes in the residual limb, I would love to hear from you. Tell me how you deal with this challenge. 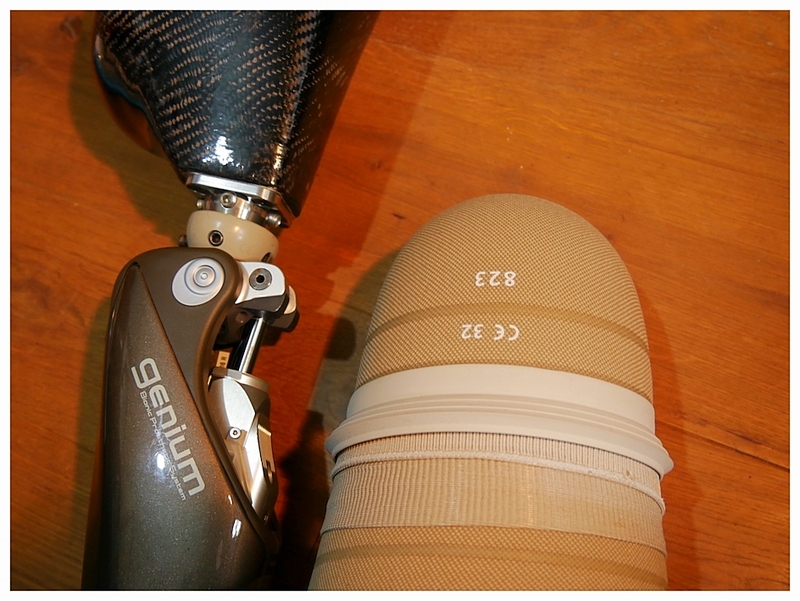 How does your prosthetist go about it? Did you come up with your own DYI solution, either as a permanent fix or as a back-up option when needed? Let me know.